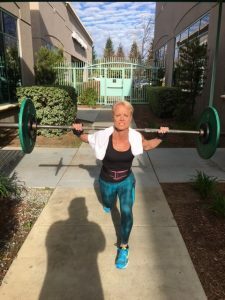 Jacquie began her fitness journey over 30 years ago as an Aerobics instructor and weightlifter. But her fitness goals were unexpectedly interrupted by a violent injury to her neck and spine sustained in a car accident caused by a drunk driver when she was young. As the years went by she continued her physical fitness activities with visits to chiropractors to help get through the chronic cycle of pain and discomfort. 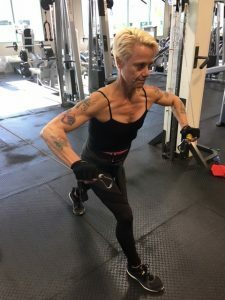 Then, with her children older and the desire to pursue an unachieved goal growing stronger, she took the leap to kick start her dream to participate in a bodybuilding competition. But over time, the intensity of the workout regime required to meet a competitive posing standard slowly took its toll on the hidden functional weakness caused by her teenage car accident. Then, her workouts came to a grinding halt with the inability to lift weight without excruciating pain. Feeling desperate she turned to McCollum Family Chiropractic for help. By the time she came to see Dr McCollum, she was unable to lift her arms above her head, was suffering from headaches and not able to sleep through the night. 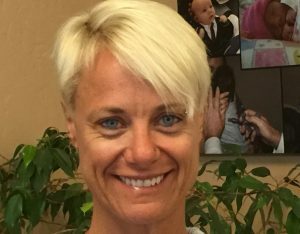 Dr McCollum began a rehabilitation program with her focused on reducing vertebral subluxations* while restoring the structural integrity of her spine. Jacquie committed herself to his corrective care program with its regular adjustments, and within weeks her pain and discomfort had lessened and she was able to begin lifting again, and began to see and feel her body regaining its strength. Four months later, she moved into the wellness care phase, and integrated chiropractic care as part of her lifestyle. I would not have been able to do this competition without McCollum Family Chiropractic. The level of intensive training five days a week would have been impossible without Dr. McCollum’s supervision and care. I recommend that anyone in chronic pain or discomfort consider a consultation at McCollum Family Chiropractic. The level of care Dr. McCollum has for his patients has allowed my body to heal faster and function better. Thank you, Jacquie, for being such an AWESOME patient!